It was going to be simple and quick pick-up of a few bottles at a winery in northern Sonoma County, but why not make a day of it and stop at a few small producers I’ve wanted to check out? Planning the visits came together quickly, and I invited my friend Russell along for the day. The late-spring weather was perfect – bright and sunny but not too hot. We stopped to pick up the small wine order at Peay Vineyards in Cloverdale. I hadn’t made any special arrangements to do anything more than pick up the wine there – I wasn’t sure whether they might have time for Russell and me to stay for a short visit, and it turned out that they were too busy to accommodate us that day. That wasn’t a big surprise, but since I’d allowed some extra time in our schedule just in case they could see us at Peay, we had some time to kill. Russell suggested we stop at Costeaux French Bakery near the Plaza in Healdsburg – sounded like a good idea to me. It was a fine way to plan another quick winery stop that morning while relaxing with coffee and a scone in the outdoor seating area just off the sidewalk. After considering a few options, we decided to head out to Quivira Vineyards & Winery in nearby Dry Creek Valley. Quivira 2012 Sauvignon Blanc, Wine Creek Ranch, Dry Creek Valley. Light straw color, very herbal/grassy aromas with grapefruit plus a floral note. Medium-light bodied with lively acidity and a bright, clean finish. Quivira 2013 Rosé, Wine Creek Ranch, Dry Creek Valley. Made from 70% Grenache, 15% Syrah, 15% Mourvèdre, specially picked and crushed/pressed for Rosé and made in stainless steel. Light salmon/pink color, this displayed strawberry, pear, and stone fruit aromas, along with fresh herbs and touches of spice and flowers. Lighter-bodied with juicy acidity and a crisp finish, nice. Quivira 2011 Montepulciano / Sangiovese, Dry Creek Valley. 40% Montepulciano, 60% Sangiovese. Medium purple color, showing bright red fruits, spice, earth, and sweet oak on the nose. Medium weight on the palate, with a bright texture and refined tannins on the finish. Quivira 2011 Zinfandel, Dry Creek Valley. 80% Zinfandel, 10% Petite Sirah, 7% Carignane, 2% Cabernet Sauvignon, 1% Syrah, from estate and purchased fruit. Medium color, this had spicy and brambly raspberry and boysenberry fruit with mild undertones of vanilla/oak. Medium-bodied with a richer mouthfeel than the previous wine, finishing with moderate tannins – very representative of a good Dry Creek Valley Zin. Quivira 2011 Zinfandel, “Quest,” Wine Creek Ranch, Dry Creek Valley. 85% Zinfandel, 15% Petite Sirah, entirely from estate fruit. Medium color, featuring a darker fruit profile than the first Zin, with blackberry fruit along with black pepper, spice, and chocolate. A bit richer texture on the palate than the previous wine, with big but refined tannins. Quivira 2011 Mourvèdre, Wine Creek Ranch, Dry Creek Valley. 90% Mourvèdre, 10% Grenache. Medium color, opening with cranberry and strawberry fruit that turned to darker fruit tones with more aeration, with dried herbs, earth, and black pepper all in support. Medium weight with a lively mouthfeel and tannins that built in intensity over the long finish, nice. Quivira 2011 Syrah, Wine Creek Ranch, Dry Creek Valley. 93% Syrah, 6% Cabernet Sauvignon, 1% Mourvèdre. Medium purple color, this showed meaty/savory aromas upfront, plus dark berry fruit, black pepper, and herbs. Fairly big and bold on the palate with plenty of structure and a grippy tannic finish – lots of promise but this will need time for the tannins to mellow. It had been quite a few years since I’d visited Quivira, located in the heart of Dry Creek Valley. I’d tried a number of their wines at various tasting events more recently, though, so I was aware that they had undergone a number of changes since my last visit there. The property where the winery is located had been planted to winegrapes starting in the early 1960s and was purchased by Henry and Holly Wendt in 1981. The Wendts launched their Quivira label in 1987 with the help of noted winemaker Doug Nalle. The winery and vineyards were purchased in 2006 by Pete and Terri Kight. The Wendts started Quivira on the road to being an environmentally-friendly winery. They installed rooftop solar panels that supply their energy needs, and they reduced water usage, restored Wine Creek (which runs through the property), and farmed their estate vineyard using organic and biodynamic methods – it’s been certified by Demeter since 2005. All this helped draw the Kights to the Quivira property, and they have continued to make responsible stewardship of the land a key part of their ownership. The estate vineyards include Sauvignon Blanc, Zinfandel, Petite Sirah, various Rhône grapes, and a few other varieties. The Kights have acquired additional estate vineyard property since 2006, including a site with century-old Zin vines. The Kights brought on highly-regarded winemaker Hugh Chappelle to join Quivira in 2010. Although Hugh was best-known at that time for his winemaking at Flowers and Lynmar – unlike Quivira, both of those producers specialize in Chardonnay and Pinot Noir – he’d previously been the winemaker at Madroña Vineyards in El Dorado County, where he had worked with many of the same grape varieties as at Quivira. 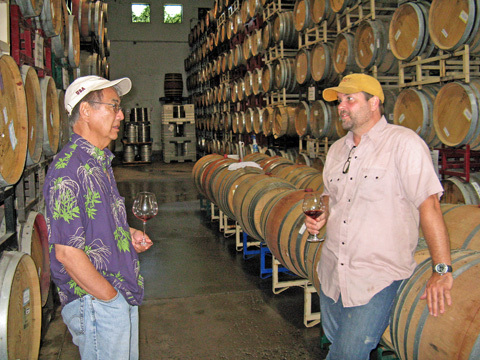 Hugh uses native yeast fermentations for the wines, and use of new oak is modest. Russell and I headed into the tasting room where were greeted by Erin, who poured us seven of the winery’s current releases. I couldn’t help but notice the three gnarly old vines mounted on the tasting room wall, and Erin told us that they’re 50-year old Petite Sirah vines. 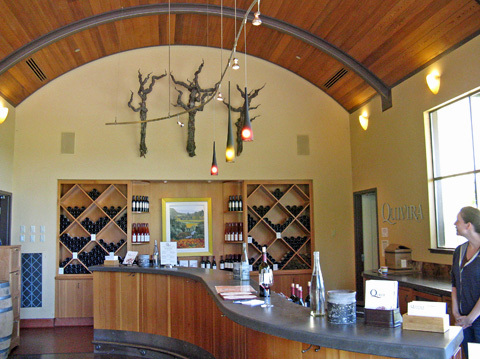 Nearly all of the Quivira wines are produced from 100% estate-grown fruit – about the only exceptions are the Dry Creek Valley appellation bottlings of Sauvignon Blanc and Zinfandel, and these are also the only wines that are distributed, with the rest being sold through the tasting room, website, and wine club. The first wine we tasted was a vineyard-designated 2012 Sauvignon Blanc from Fig Tree Vineyard, a specific portion of the estate’s Wine Creek Ranch. The site was named for 135-year old black mission fig tree there, and it features gravelly soil. There were multiple picks for the fruit, with around ? of it coming from the Sauvignon Musqué clone. The fruit was whole-cluster pressed, and the wine was made in about 85% stainless steel plus some French oak and acacia barrels. Next was a Grenache-based 2013 Rosé – fruit is always picked especially for this wine and gets about 2-4 hours of skin contact before pressing (though this bottling also included a small amount of Grenache saignée). The Rosé is aged on the lees in stainless steel tanks. Switching to reds, we tried a limited wine club bottling of 2011 Montepulciano/Sangiovese, consisting of 40% Montepulciano (2011 was first production vintage of that variety) and 60% Sangiovese. We moved on from there to Zinfandel – Quivira produces up to five different Zin bottlings each year. 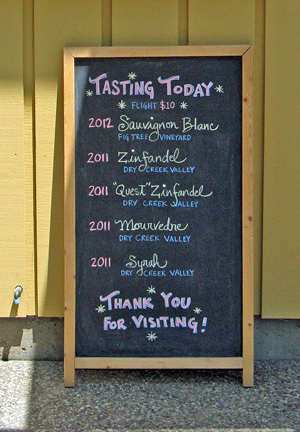 The first that we tasted was the “basic” 2011 Dry Creek Valley Zin, aged in French, American, and Hungarian oak. The bolder 2011 “Quest” Zinfandel is entirely from biodynamically-farmed estate fruit from three different sites. We finished up with 2011 Mourvèdre and 2011 Syrah, both from estate fruit and both aged in a variety of vessels, from 60-gallon barriques to 900-gallon foudres. After we’d finished our tasting, we spotted Hugh Chappelle as he was working on his laptop at one of the picnic tables near the tasting room – a fine day to get some work done outside! Russell and I talked with him briefly but we all had to be on our way – I’d love to come back and talk with Hugh in more depth sometime. Quivira presents a solid line-up of wines that reflect their warmer-climate vineyard sources but are made with more elegance and restraint than some from the area, and it’s a worthwhile stop when visiting Dry Creek Valley. MacLaren 2010 Syrah, Judge Family Vineyard, Bennett Valley. Aged for 12 months in 15% new French oak. Medium-dark color, with savory/herbal aromas plus plum and darker fruits, black pepper, and a floral component. Medium-bodied with a very lively texture in the mouth, and moderate tannins on the long, tasty finish, nice. MacLaren 2011 Syrah, Atoosa’s Vineyard, Russian River Valley. Aged for 14 months in 15% new French oak. Medium purple color, this featured herb and pepper notes with blackberry and lots of spice on the nose. This had a richer mouthfeel than the previous wine but still displayed juicy acidity, finishing with fine tannins – very tempting now but worthy of time in the cellar. MacLaren 2011 Syrah, “Drouthy Neebors,” Sonoma County. Sourced from 50% Samantha's Vineyard and 33% Atoosa’s Vineyard, both in Russian River Valley, and 17% Stagecoach Vineyard in Napa Valley. Medium-dark purple, showing more upfront black fruit aromas along with big spice and black pepper components. While this had a fairly rich texture, the acidity added bright, cranberry-like notes in the mouth, and the long finish had big but refined tannins, nice. MacLaren 2010 Syrah, “Drouthy Neebors,” Sonoma County. Sourced from 50% Judge Family Vineyard in Bennett Valley, plus 25% Saralee's Trenton Station and 25% Samantha's Vineyard, both in Russian River Valley, aged in older oak. Medium-dark color, this also featured a fruit-forward character, with a slightly riper profile than the 2011 vintage, along with spice, earth, and a slightly briny/mineral note. Medium-full bodied but with zippy acidity, this finished with grippier tannins. MacLaren 2011 Syrah, Samantha’s Vineyard, Russian River Valley. Aged for 14 months in 20% new French oak. Medium purple color, this showed plum and blueberry fruit, plus herbs, pepper, and plenty of baking spice. Medium-bodied with a lively texture and chalky tannins on the finish – this needs time but certainly shows potential. MacLaren 2010 Syrah, Samantha’s Vineyard, Russian River Valley. Aged for 14 months in 20% new French oak. Slightly darker color, displaying more ripe and fruit-forward plummy aromas than the 2011 vintage, along with spice, dried herbs, and a touch of sweet oak. This had a fairly rich mouthfeel with good structure and chewy tannins. MacLaren 2011 Syrah, Stagecoach Vineyard, Napa Valley. Aged for 14 months in about 20% new French oak. Medium-dark color, with herbs and pepper notes upfront, followed by blackberry, spice, and undertones of vanilla/oak. Big and rich on the palate, this finished with big, grippy tannins that will need time to settle down. MacLaren 2013 Sauvignon Blanc, “Lee’s,” Rogers Vineyard, Dry Creek Valley. Barrel-fermented and aged for 6 months in neutral oak, with no malolactic fermentation. Light straw color, featuring floral aromas, tropical and stone fruits, a touch of spice, and a stony mineral note. Medium-bodied with a viscous yet lively texture and clean finish, nice. Russell and I stopped for lunch at the Dry Creek General Store, which dates back to the 1880s. We sat out front to enjoy our sandwiches (those dated back only a few minutes) while watching the cars and motorcycles go by along Dry Creek Road. After lunch, we headed south toward Santa Rosa and then along Highway 12 through the Valley of the Moon and into the town of Sonoma. We found a parking spot just up the street from Sonoma Plaza and only a block away from our destination, the new tasting room of MacLaren Wine Company. We walked down a pleasant open passageway of the Sonoma Court Shops complex directly south of the Plaza and stepped into the MacLaren Tasting Lounge, where owner/winemaker Steve Law welcomed us. I’d met Steve at a Rhone Rangers tasting event earlier in the year – it was the first time I’d heard of the winery and the wines I tried were some of my favorites of the tasting. Although Steve makes small amounts of Sauvignon Blanc and Pinot Noir, nearly all of MacLaren’s production is Syrah sourced from cool-climate North Coast vineyards. Steve told us that the Tasting Lounge opened in late 2013. Why “lounge”? 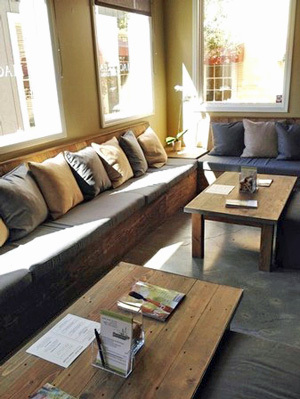 Well, the space does have a relaxing feel to it, with comfortable seating arranged near the large windows, and a small outdoor seating area as well. In fact, toward the end of our visit there, a small group arrived and settled in on the sofa-like cushions as Steve poured tastes of his wine for them. Not wanting to get too comfortable, Russell and I stepped up to the front of the tasting bar and talked with Steve as we sampled his wines. Steve is originally from Scotland, and he retains his charming accent – he had related a story at the Rhone Rangers tasting that when he describes his Syrahs as “herbal” it can come out sounding a bit too much like “hairball”! The winery name comes from the Scottish Clan MacLaren, of which the Law family is a part. Before the wine bug bit him, Steve worked in the electronics field. He relocated for work to southern France, where he lived for ten years, and during that time he took a special liking to the Syrahs of the northern Rhône Valley. After relocating once again to California for business, Steve was given the opportunity to work during crush in 2005-2006 by Michael Talty at Talty Winery in Dry Creek Valley, and by 2007 he was producing his own wine. 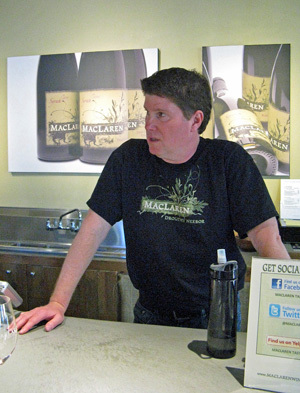 MacLaren has grown from that initial four-barrel production to about 1,000 cases per year, and the label became Steve’s full-time job in 2011. The first vintage was made at Unti Vineyards, and the wine has been made at Talty since then. 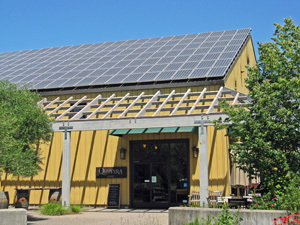 The Sonoma tasting room location is convenient for Steve, since he and his wife Heather live just a short distance away. Having experienced the combination of wine and food in southern France, it’s no surprise that Steve seeks to craft his Syrahs in a food-friendly style. He told us that a goal is for the “tongue to be energized” and for the wine to complement rather than compete with food. His wines are definitely not in the big, bold style of Syrah that’s prevalent in some parts of California (Paso Robles, for example) – only two of the seven Syrahs we tried topped 14% alcohol. Steve said that another goal is for the wines to display the distinctive character of their cool-climate vineyard sources, mostly from Bennett Valley and Russian River Valley. The vineyard sites are cooled by marine air and fog, allowing the flavors that Steve looks for to develop without the higher sugar levels found in warmer-climate fruit. All of the current Syrahs are sourced from single vineyards, except for the “Drouthy Neebors” bottling (it means “thirsty neighbors” in the old Scots language), which is blended in the first half of the year following harvest with help of MacLaren wine club members. Judge Vineyard is located in southwestern Bennett Valley – the coolness of the site is demonstrated by the 2010 bottling’s 13% alcohol from fruit picked in November. Steve has not been able to get fruit from there since 2010, but he’s sourced Syrah from a couple of other fine Bennett Valley vineyards – Vivio in 2012 and Moaveni in 2013 and this year. Samantha’s Vineyard is on Limerick Lane in Russian River Valley, situated on a very steep slope. Farther west in Russian River Valley is Atoosa’s Vineyard, on Abramson Road west of Santa Rosa. More known as Pinot country, this can be a tough spot for Syrah to ripen, and the inaugural MacLaren Atoosa’s bottling from the 2011 vintage is under 13% alcohol. Steve also sources fruit from well-known Stagecoach Vineyard, on volcanic soil at 1,600-foot elevation above Napa Valley. The Syrah comes from the vineyard’s K2 Block – no, the name is not because it resembles a formidable peak, it just happens to be the block designation. 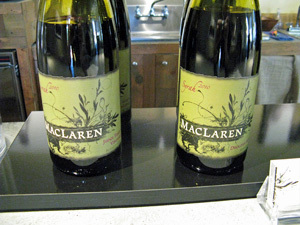 As mentioned earlier, MacLaren also produces a little Sauvignon Blanc (a favorite variety of Steve’s mother) and Pinot Noir (his wife’s request). Steve models the Sauvignon Blanc on a Loire-style wine. The MacLaren Syrahs certainly lean toward a northern Rhône style (perhaps Saint-Joseph would be the closest comparison), though they’re undeniably Californian too. Steve told us that he bases his picking decisions largely on the acidity of the fruit, aiming for a TA in the mid- to high 6 range. All the fruit is destemmed and cooled with dry ice for a cold soak of 3-5 days. The wines are allowed to ferment with native yeast in half-ton bins, with two hand punchdowns per day, spending a total of 14-19 days on the skins. After pressing to barrel, Steve stirs the lees regularly for 2-3 months. The Syrahs are aged for around 14 months in French oak, with about 15-20% new barrels. Russell and I tasted with Steve through a line-up of MacLaren 2010 and 2011 Syrahs, and we finished up with the 2013 Sauvignon Blanc. Although still very youthful, the 2010s were already drinking beautifully but have the structure to age for years. The 2011 Syrahs were still somewhat tight but showed plenty of promise – something I’ve seen of cooler-climate 2011 California wines in general. The Atoosa’s Vineyard and “Drouthy Neebors” bottlings were the most forward of the 2011s, but these will certainly develop nicely with more bottle age. And although MacLaren is a Syrah specialist, the Sauvignon Blanc should not be ignored – it’s a fine rendition with appealing aromatics and great texture. Steve was a pleasure to taste with – friendly and sociable, serious about his wines yet with a delightful sense of humor. MacLaren is making some of the best cooler-climate California Syrahs to come along in awhile. They show that you don’t need high brix / high alcohol or lots of new oak to make a Syrah that’s got plenty of flavor and body. Steve’s Syrahs displayed good distinction between the various single-vineyard bottlings and clearly featured the herbal and peppery nature of the variety when grown at cooler vineyard sites. MacLaren is fairly new on the scene – and a discovery for me just this year – and they’re definitely a label I’ll be following in the future. LaRue 2011 Pinot Noir, Sonoma Coast. Sourced from Rice-Spivak and Emmaline Ann vineyards, aged for 17 months in 33% new French oak. Medium-light garnet color, featuring pretty floral aromas along with bright raspberry and cherry fruit, dried herbs, and earth. Medium-bodied, this had a lively texture and good structure, with a stony mineral note and moderate tannins on the finish, nice. LaRue 2010 Pinot Noir, Sonoma Coast. Sourced entirely from Rice-Spivak Vineyard, with 115, 667, 777, and Swan clones, aged for 16 months in 40% new French oak. Slightly darker ruby color, with more forward black cherry fruit, tea leaf, earth, and spice. Richer, rounder mouthfeel than the 2011 vintage, finishing with more noticeable tannins. LaRue 2011 Pinot Noir, Rice-Spivak Vineyard, Sonoma Coast. From 115 and 667 clones, aged for 17 months in 50% new French oak. Medium-light ruby color, with herbal aromas leading off, followed by plum and darker fruits, flowers, spice, and undertones of vanilla/oak. Bright, lively texture on the palate, with a stony mineral element and fairly big but refined tannins on the long finish – while this will clearly benefit from time in the cellar, it’s already a very elegant Pinot. From Sonoma Plaza, it was a short drive to our next appointment, with owner/winemaker Katy Wilson of LaRue Wines. LaRue focuses exclusively on cool-climate Sonoma Coast Pinot Noir. 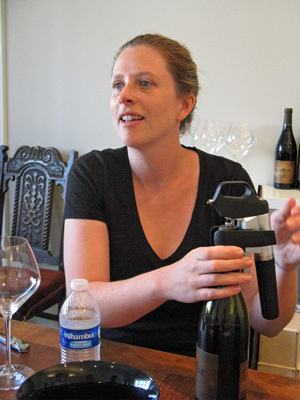 Katy was making her wines at the Kamen Wines facility near the Sonoma airport – she was the associate winemaker at Kamen for 5 years – but we learned that she was just about to leave there shortly after our late-May visit. She now makes her wines in the Healdsburg area and has tastings by appointment in Sebastopol. I met Katy at the West of West tasting of West Sonoma Coast wines in the summer of 2012, where she poured the first two vintages of her LaRue Pinot Noirs, from 2009 and 2010. I thought the 2010 bottling in particular was a standout, and I’ve enjoyed tasting her wines at various events since that time. I’d tried to arrange a visit with Katy a couple of times before but we hadn’t been able to coordinate a time until this occasion. The winery is named for Katy’s great grandmother, Veona LaRue Newell, a strong-minded woman whom Katy names as an inspiration. Katy decided early on that she wanted to become a winemaker. She grew up on a walnut orchard in the Manteca area and had initially intended to study agriculture, but quickly realized that making wine would satisfy both her creative and scientific sides. After earning her degree from Cal Poly in San Luis Obispo, she worked at a number of highly-regarded wineries, including Testarossa, Torbreck, Craggy Range, Joseph Phelps, and Flowers – where she worked her way up to become assistant winemaker – before landing at Kamen. A plus to working at Kamen was being given the opportunity to make her own wine there. It was while Katy was at Flowers that she began working with their winemaker Ross Cobb (now winemaker at Hirsch as well as his own label), a working relationship that is still continuing with a wine consulting partnership. Ross and Katy consult for Banshee Wines and Claypool Cellars, as well as for new start-up winery Smith Story Wine Cellars. Katy has also been able to share West Sonoma Coast Pinot fruit sources with Ross – these have included Rice-Spivak, Emmaline Ann, and Joy Road vineyards, and Coastlands Vineyard (owned by Ross’ family) beginning with the 2012 vintage. Katy is now also working with fruit from well-known Thorn Ridge Vineyard. The initial LaRue 2009 release totalled about 300 cases, and the production has not grown a whole lot since then. With Katy’s busy schedule and her desire to do everything herself with making her wines, it’s no surprise that she’s keeping things that small! Katy’s experience with Ross at Flowers – on the far reaches of the Sonoma Coast – led her to focus on similar vineyards located in marginal spots for ripening even Pinot Noir. The 2010 and 2011 LaRue Pinots were sourced from two vineyards, Rice-Spivak and Emmaline Ann. Rice-Spivak is located in the Sebastopol Hills – a particularly cool, foggy area. Planted to Swan and Dijon clones of Pinot around 2000, the vineyard has both Goldridge sandy loam soil found in much of the area as well as volcanic ash that is far less common there. Emmaline Ann Vineyard is a smaller site in the cold Freestone area south of Occidental, closer to the coast and at higher elevation than Rice-Spivak. Emmaline Ann was planted about 2001 with 115 and 777 clones in Goldridge soil. Katy led us to a small meeting room at Kamen, where she poured three wines for us – her 2010 and 2011 Sonoma Coast Pinots, plus her new 2011 Rice-Spivak Vineyard Pinot, LaRue’s first vineyard designate release (there’s a 2012 Emmaline Ann vineyard designate on the way). The 2010 Sonoma Coast Pinot is actually sourced entirely from Rice-Spivak Vineyard, while the 2011 is mostly Rice-Spivak, with about ¼ ton of 777 clone fruit from Emmaline Ann. With 2011 being such a tough year in the vineyard throughout much of the area, Katy was able to make less than 150 cases of the Sonoma Coast bottling – less than half of the 2010 production – though she added just under 50 cases of the Rice-Spivak vineyard designate. With such a tiny production, that wine is only available to LaRue mailing list members. I was intrigued by the Coravin device that Katy used to pull wine from the bottles on the table for Russell and me. Fairly new on the market, the Coravin works by pushing a thin needle through the cork to extract wine, replacing that space inside the bottle with inert gas, so the cork does not need to be removed. Katy told us that she’s found it very useful for pouring small amounts of wine for tastings such as ours, keeping the wine in the bottle fresh for future tastings. With as small a production as LaRue has, it makes sense to avoid having to open too many bottles. I asked Katy about her winemaking as we tasted through the three wines. She told us that her picking decisions are based mostly on flavors, so as with many winemakers, it’s important for her to be in the vineyard as often as possible as the potential harvest dates near. Katy used entirely destemmed fruit for her first three vintages in 2009-2011 but used around 10-15% whole clusters in fermentations for some lots in 2012 and 2013. She moves small fermentation bins into a cold room for a pre-fermentation cold soak, or uses stainless steel tank chillers for larger lots. Katy has let fermentations start by native yeast and then inoculates with selected cultured yeast, with no nutrient additions. Most lots are pressed straight to barrel, and Katy occasionally will rack a wine if she feels that will be of benefit. The Sonoma Coast wines are aged in about 30-40% new French oak, while the Rice-Spivak Vineyard bottling was in 50% new oak. Favorite coopers include Rousseau, François Frères, and Remond. In addition to the three wines that Russell and I tasted with Katy, I also tried two new 2012 LaRue Pinots at the recent West of West tasting. The 2012 Sonoma Cost bottling was bright and savory, already very appealing, while the 2012 Emmaline Ann Vineyard Pinot is more structured, minerally, and “serious,” and will take more time to develop. Both of these 2012 Pinots will be released soon. I’ve enjoyed tasting the LaRue Pinots with Katy every time I’ve had the opportunity at various events, and it was great to finally sit down to talk with her for awhile. Her enthusiasm for what she’s doing is clear to see, and I don’t know that I’ve seen her without a big smile on her face. Katy manages to make her wines with low alcohol for California Pinot – the wines I tasted recently have ranged from 12.4% to 13.2% – but they still pack plenty of fruit to balance their juicy acidity. So far, the LaRue Pinots have displayed the character of their respective vintages very clearly, and it seems like they just keep getting better each year. I’m looking forward to trying upcoming wines from Katy’s new fruit sources. 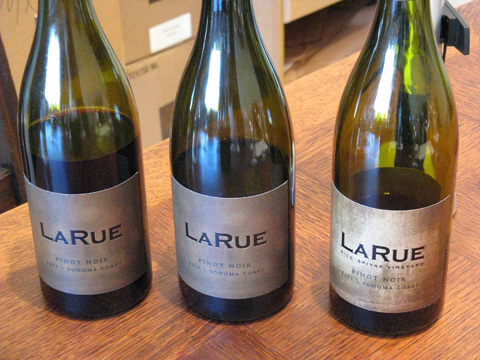 LaRue is certainly a new Pinot producer to watch. Lightning 2013 Grenache, Swansboro Vineyard, El Dorado County. Tank-fermented, from Taransaud barrel. Medium-light garnet color, this had ripe cherry aromas along with herbs and a touch of pepper. Big and structured, with a chewy tannic finish. Lightning 2013 Grenache, Swansboro Vineyard, El Dorado County. Tank-fermented, from Ermitage barrel. Medium-light color, showing brighter red fruit on the nose along with a more noticeable spice component, finishing with grippy tannins. Lightning 2013 Grenache, Swansboro Vineyard, El Dorado County. Puncheon-fermented. Similar color to the two previous wines, with ripe red fruit aromas plus spice and a more obvious sweet oak element than the first two wines. This had a rounder, richer mouthfeel, with big but more refined tannins on the finish. Lightning 2013 Grenache, Swansboro Vineyard, El Dorado County. Rough final blend, with about 75% tank-fermented and 25% puncheon-fermented. Medium-light garnet color, this featured ripe cherry and strawberry along with spice, a touch of chocolate, and well-integrated oak. Big, moderately rich, and structured on the palate, with a firm tannic finish. Lightning 2013 Grenache, Fenaughty Vineyard, El Dorado County. Tank-fermented. Medium-light color, this displayed earthier and less upfront red fruit aromas than the Swansboro samples, with herbal and floral notes as well. Medium weight in the mouth with plenty of structure and grippy tannins. Lightning 2013 Grenache, Fenaughty Vineyard, El Dorado County. Rough final blend. Medium-light garnet color, this had bright but less ripe red fruit than the Swansboro samples, with herb, spice, and chocolate notes. Structured on the palate, finishing with big but fairly round tannins. Lightning 2013 Grenache, Chevalier Vineyard, Mendocino County. Tank-fermented, from Remond barrel. Medium-light color, with earthy aromas along with bright red fruit and touches of pepper and dried herbs. Bold mouthfeel with a grippy tannic finish. Lightning 2013 Grenache, Chevalier Vineyard, Mendocino County. Tank-fermented, from Ermitage barrel. Medium-light color, this was more fruit-forward, with a bigger spice component as well. Big and structured but with a rounder texture than the previous wine, with finer tannins on the finish. Lightning 2013 Grenache, Starr Ranch, Paso Robles. Tank-fermented. Lighter garnet color, this showed more shy aromatics than the earlier barrel samples, with something of a baked cherry character. Medium-bodied with a lighter texture than the earlier samples, this finished with chalky tannins. Lightning 2013 Mourvèdre, Juliana Vineyard, Pope Valley. Tank-fermented. Medium-light ruby color, this was herbal and earthy, with plummy fruit and an iron/mineral component. Medium weight on the palate with a lively mouthfeel and moderate tannins on the finish. Lightning 2013 Red Blend, California. Trial blend with 75% Starr Ranch Grenache and 25% Juliana Vineyard Mourvèdre. With a color somewhere between those of the two components, this featured herbal red fruit aromas along with an earthy note. More depth and texture in the mouth than the Starr Ranch Grenache on its own, finishing with similar chalky tannins. For our final stop of the day, Russell and I headed east along Highway 121 through Carneros and then turned north on Highway 29 through Napa. A short distance north of town, we drove up to the Silenus Vineyards facility, just west of the highway. There we met Randy Hester of Lightning Wine Farm – another Rhône variety specialist. I’d met Randy and his wife Brooke at the same Rhone Rangers tasting where I’d first tried the MacLaren Syrahs, and like those wines, I was impressed with the my first taste of the Lightning wines there. Randy and Brooke are originally from Texas, and Randy had sold wine there at Glazer’s, the largest wine and spirits distributor in the state. He decided that he wanted to create his own wine and he made a list of people and places he would want to work for, mainly top Napa producers. He and Brooke moved to Napa in 2006, where he started on his winemaking path working at Cakebread Cellars. Over the next few years, he gained experience at other wineries including Caldwell and Colgin, worked with high-profile winemakers such as Helen Keplinger, Michel Rolland, Mike Hirby, and Andy Erickson, and in 2009 he became assistant winemaker at Realm Cellars in Napa. Lightning was launched with the 2011 vintage, and in 2012 Randy left Realm to concentrate on his own label full-time. Brooke has worked as CFO of Patz & Hall Wine Company, and handles the business side of Lightning. The initial vintages were produced in Pope Valley and moved to Silenus only a short time before my visit there – a more convenient location for Randy and Brooke since they live nearby. Production of the currently-available wines is only a few hundred cases but that will grow as new vintages are released. Randy told Russell and me about his plans for Lightning Wine Farm, which he sees as an umbrella company that will include other labels in the future. Although Randy has been in Napa Valley for eight years, he and Brooke still have strong ties to their home state of Texas, and Randy plans to create a new label with wines made from Texas fruit and aimed specifically at distribution there. He currently does some consulting work for Texas wineries and he and Brooke intend to move back there eventually – Randy feels that bringing his experience in making high-quality wines in Napa back to Texas will be helpful in raising the level of winemaking there. When I’d first tasted the Lightning wines earlier this year, I tried a white Rhône-style blend called “CdP Blanc” sourced from Starr Ranch on the Westside of Paso Robles, a Grenache from Sonoma County’s Kick Ranch, and a Syrah from Phoenix Ranch, near the base of Atlas Peak at the cooler southern end of Napa Valley. I thought all three were quite good, with the bright and fresh 2013 “CdP Blanc” and the savory and peppery 2011 Phoenix Ranch Syrah being particular standouts. So I was a bit disappointed to find out from Randy that he is no longer able to get the Phoenix Ranch Syrah fruit, but very interested to learn more about the direction in which he’s steering his label – focusing on single-vineyard 100% Grenache. Lighting will produce three single-vineyard Grenache bottlings from the 2013 vintage, and Randy is planning to add a single-vineyard Mourvèdre in 2014. He will continue making the “CdP Blanc” and there will also be a Grenache/Mourvèdre blend from 2013. Randy would like to add a Mourvèdre-based blend in the future, and he didn’t rule out making another Syrah at some point as well. Randy certainly knows top-quality fruit, having worked with highly-regarded Napa vineyards such as To Kalon and Dr. Crane, and he’s seeking out quality fruit sources for his wines. He’s working with head-trained Grenache from two El Dorado County vineyards, both managed by the area’s top vineyard manager, Ron Mansfield. Swansboro Vineyard is to the northeast of Placerville, while higher-altitude Fenaughty (about 2,600 feet elevation) is just north of Placerville. 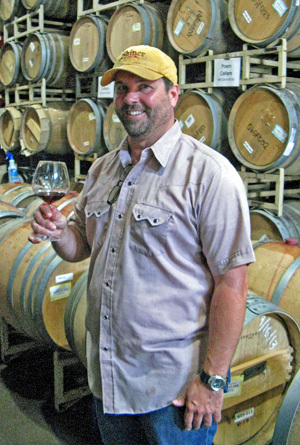 Another Grenache source is Chevalier Vineyard, near Calpella in Mendocino County – Peter Chevalier is a longtime vineyard manager in the county. Lightning’s Mourvèdre comes from Juliana Vineyard in Pope Valley – Mourvèdre from there forms the basis for Relic Wine Cellars’ “Ritual” bottling. We walked back into the Silenus barrel room, where Randy had a number of his barrels easily-accessible on the floor that day. Russell and I were able to taste a number of 2013 Grenache barrel samples, plus a Mourvèdre sample and a trial Grenache/Mourvèdre blend. As we tasted, Randy told us a bit about his winemaking techniques. For the “CdP Blanc” blend (the 2013 vintage was 52% Grenache Blanc, 32% Picpoul, and 16% Roussanne, all picked together), he’s planning to use more stainless steel and less oak this year, with less of the wine going through malolactic fermentation than the 2013 version (40% in that vintage). One thing that sets Randy apart from many Grenache producers in California is that he uses winemaking procedures he’s picked up working with Napa Cabernet for making his Rhône variety wines. One example is his use of “oxygen treatment” – introducing medical-grade oxygen into the wine with a regulator during primary and malolactic fermentation, using dissolved oxygen meter to monitor when it’s saturated. He explained to us that this helps to soften the tannins – like Cabernet, Grenache can be a very tannic variety. Randy noted that the 2013 wines (especially the El Dorado Grenaches) are noticeably more tannic than 2012s, and he realizes that he may need to modify his procedures to deal with similar big tannic years in the future. Randy mentioned one goal for his wines is maintaining the perception of sweetness in the fruit while still being totally dry. We tasted through barrels with wines that had been fermented in tanks and in puncheons – markedly different – and Randy also came up with a quick trial blend of barrels from the two El Dorado vineyards. Both blends showed the integration of the components to good advantage. It was interesting to pick up chocolate aromas in each of these two trial blends since I usually associate that with new oak, but the wines all in older barrels in this case. Randy feels that this chocolate element is from the extended maceration and frequent lees-stirring. We finished up our tasting with Grenache from Starr Ranch and Mourvèdre from Juliana Vineyard, and a trial Grenache/Mourvèdre blend made from these two components. Going through the 2013 barrel samples with Randy was fun, and the distinction of the different Grenache vineyards came through clearly. It was interesting to find out more about the direction in which Randy is taking Lightning Wines and about his plans for wine in Texas. The 2013 wines were obviously still very young – they’ve got time for tannins to mellow a bit, and the trial blends already showed how the final wines should become more than just the sum of their component parts. A postscript to our visit with Randy is that the Napa earthquake in late August 2014 caused considerable damage inside the Silenus barrel room. Recovering barrels there requires great care and time, so it’s still a waiting game to find out whether any of the Lightning barrels were lost as a result of the quake – hopefully any losses will be minimal. Tasting with Randy showed me a different way of approaching Grenache, with some interesting twists from what I’ve seen elsewhere in California. The early Lightning releases have been promising, and it should be fascinating to see how this new label’s wines evolve in the coming years. What started out as a simple wine order pick-up turned into a full day of winery and tasting room visits. There are new and interesting things to discover every year on the California wine scene, and this day spotlighted three promising newer wineries and another that has shifted its winemaking direction in a positive way in recent years. As always, thanks to everyone that we visited for being so generous with their time and their wine!